This entry was posted in gyAna sAram, hindi, Other on November 27, 2014 by karthik sriharsha. यह बात स्पष्ट है की भगवान हाथी की रक्षा करने के लिए त्वरा किए। श्री पराशर भट्टर स्वामीजी भगवान के इस त्वरा-वेग को प्रणाम करते हैं।भगवान अपने धाम से प्रस्थान किए और उनको यह भी याद नहीं रहा की वो सदैव अपना सुदर्शन चक्र दाहिने हस्त में धारण करते हैं।अगर उनको यह स्मरण होता तो उन्होने वो जहां हैं वहांसे ही वह चलादिया होता और चक्रराज ने अपना कार्य कर दिया होता।अथवा, वो चक्रराज नित्य धारण करते हैं यह स्मरण होकर भी उन्होने हाथी के पास स्वयं जाकर चक्रराज का उपयोग किया।कारण यह है की, श्री शठकोप स्वामीजी के पाशूर अनुसार गजेन्द्र का भगवान के प्रति निष्कलंक प्रेम के कारण “कादल कलिरू” नाम प्रसिद्ध है। गजेन्द्र को सुदर्शन चक्र धारी भगवान के सौन्दर्य का आनन्द प्राप्त करके कमलपपुष्प उनके श्री चरणोंमें समर्पित करनेकी अभिलाषा थी।इस कारण भगवान अपनी जगह से यह कार्य करना छोडकर कमल सरोवर पर गए। इसका भावार्थ है की भगवान अपने आप को अपने आश्रित के मन मुजब अपने आप को भी देते हैं।श्री महाद्योगी स्वामीजी अपने मुंद्राम तिरुवंदादी में ९९वे पाशूर में गान करते हैं, “कुत्तत्तु कॉल मुदलै तुंजा कुरित्तेरिंद चक्करत्तान”. This entry was posted in gyAna sAram, hindi, Other on November 26, 2014 by karthik sriharsha. This entry was posted in gyAna sAram, hindi, Other on November 24, 2014 by karthik sriharsha. This entry was posted in gyAna sAram, hindi, Other on November 23, 2014 by karthik sriharsha. her kOn is her ruler). Naragum Suvargamum: The phrase “naragum suvargamum” refers to pain/sadness and happiness/pleasure. In thiruvAimozhi 3.10.7 (thunbamum inbamum) too, swAmi nammAzhwAr says “inbamil ven naragAgi iniya nalvAn suvarkkangaLumAi”.Here the vyAkyAnam explains narakam(hell) and suvarkkam (heaven) to mean thunbam (sufferings), and inbam (happiness) in the context of the pAsuram. With that being said, what constitutes happiness and sadness for those having parabhakthi? This (and the meaning of ‘parabhakthi’) is explained as follows.It is like hell when when such a personis separated from the Lord who is the divine consort of the one who is seated on the lotus flower (sri mahA Lakshmi – periya pirAttiAr). When he is not separated, then that is happiness for such a person. The very substance of parabhakthi is that when one is not able to survive when he is away from emperumAn. When he is in unison with the Lord, he is able to survive. There is an example given to this condition of such a person. In srIrAmAyaNam, when perumAL (rAma)was leaving the kingdom to go to forest,pirAtti (wife, sIta) wanted to accompany him in the forest. He tried to convince her by explaining about the dangers of the forest and the comforts here,and so he made his point that the going with Him to the forest would be suffering, and staying back in the kingdom would be pleasure/happiness. After listening to such a definition, pirAtti corrected emperumAn. She replied “Happiness and sadness are not defined in the way you explained. It would be different from the perspective of different people. (For me) being with you is happiness, and being separated from you in the palace is sadness; if devareer do not know this true definition please learn it from adiyen; it is not wrong to learn from others about what we do not know; unlike you whose love is limited and measured, adiyen have unlimited love for you”. 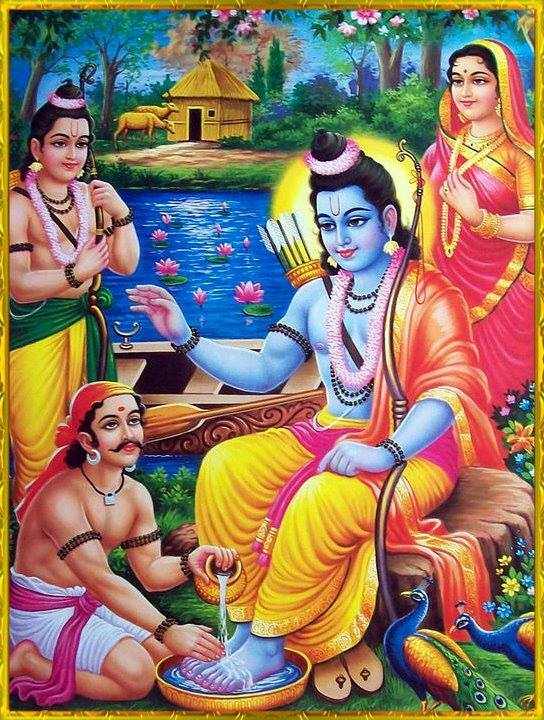 After carefully listening to her retort, Rama asked her “Ok. You said that you have got an infinite amount of love towards me. What should I do now?” Sita was quick to add “I shall lead, and all You have got to do is just follow me”. This is periyavAchAn piLLai’s vyAkyAnam (explanation/exposition). There is a Vedanthic question that may be raised here. Sita said that it is happiness when she is with Rama and it is sadness when she is not. This may be acceptable for her situation. But can other people feel the same about the Lord, that is, can somebody go to the Lord (only) and say “If I am being separated from You, it is hell and if I am not, only then it is heaven? The answer is “No” because there is a difference between pirAtti (who incarnated as Sita) and other souls like us. For us, the state of heaven and hell is when we think we are separated from BOTH the Lord and His divine consort pirAtti whereas for pirAtti, the separation limits only to the Lord. She is being referred as “EkAyaNai” and we jIvAthmAs are termed as “midhunAyars”. “EkAyaNai is the one who has only One as her sustainer, whereas “midhunAyars” have both “pirAtti and the Lord” as their sustainer. “Mithunam” refers to perumAn and pirAtti’s togetherness, duality. naaN malarAL kOnai pirivum piriyAmaiyumAi: The state of mind when one is separated from Perumal and Pirati, is being referred to as sadness; and when one is not separated from them, then it is happiness for him.iLaiya perumAL (Lakshamana)also said, making himself equal to sItAjust only in the context of not being able to bear the separation, that “Just like how Sita cannot live without You, I cannot also live without You”. This should not be understood as iLaiya perumAL (Lakshmana)is being similar to Sita whose happiness is to be Only with Rama. 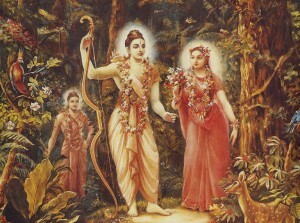 It should be understood that for iLaiya perumAL, happiness is being with the togetherness of “Rama and Sita”.That is why when leaving for the forest, iLaiya perumAL (Lakshmana) said “I want to do all the services to You and Sita when you both roam in the valleys of the forest, near the mountains, when you both sleep, and when you both are awake. Please take me with you for this reason only”. So for jIvAthmAs too it is acceptable to do service only to bothpirAtti and emperumAn together, the divine couple. thurisatRu:Here thurisu -mistake. atRu – not having that (mistake). Mistake is to use bhakthi as a means of attaining him.The bhakthi here is about suffering when separated from emperumAn and pirAtti, and being happy when being together with them. One should consider this bhakthi as adhikAri visEshaNam – that is, consider bhakthi as making them ready/eligible to receive and enjoy emperumAn’s union. Like how it is important to be hungry in order to eat food, one should have bhakthi in order to enjoy the lord. This bhakthi would not become a means/upAyam. Only bhakthi upaskAs would consider it as a means; saraNagathas would not consider it as a means to attain Him. To consider bhakthi as a means is a mistake/blemish in a person. Thurisu-atRu – refers to those who are Not having the mistake of thinking of their bhakthi as a means. sAdhagam pOl nAdhan thanadharuLe pArthiruthal: “chAtaka” is a bird that drinks no water other than the rain water; even if its mouth goes very dry it would keep looking for rain water. Similarly, it is the nature of pure (blemishless) adiyArs to keep looking for His grace/krupai as the means for attaining Him. We can see the same meanings in thirumangai AzhvAr’s: “thuNiyEn ini ninaruL alladhu(periya thirumozhi 11-8-8)”,and in periyAzhvAr’s chenniyOngu padhigam: “nin aruLE purindhirundhEn (periyAzhvAr thirumozhi 5-4-1)”. kOdhiladiyAr guNam: adiyAr (devotees) are those who do not have the blemish of using other means and seeking other benefits. A devotee is a true servant who lives with the thought “prApthAvum prApakanum prApthikkugapAnum avanE”(Note: “prApthA” is the One who is to be attained (ultimate objective), “prApakan” is the way/means to attain that ultimate destination; and this act of attaining the desired is known as “prapAthi”. So the srI vachana bhUshaNam phrase says that such a devotee performs with the thought that “My prApathA, prApakan both are same, that is Him, and it is He who would be happy when He gets us”. Since the prapannan is a property (note this english word rhymes with prapathi) of the owner (perumAL), when the Lord’s property reaches Him eventually by way of prapathi, it is the Lord who becomes happy and not vice-versa. As the only Owner of all souls, it is the Lord who enjoys when a prapannan reaches Him. Seeing the happiness on the Lord’s face, a soul can feel happy and there is nothing called a happiness of the soul for itself for us). As we reach Him it is the truth that he is the head/owner of all ofu s. Thus, in the first half of this pAsuram, swAmi aruLALa perumAl emperumAnAr talked that “benefit is none other than perumAL” and in the latter half, he described that “the means is none other than perumaLHimself”. One should realize that this is the nature/state of “kOdhiladiyAr (devotees without blemishes)”. What gives ultimate happiness to a soul (jIvAthmA) is the liberation (mOksham). In order to get liberated, one should know the inner meanings and deeper purports of (i) thirumanthram (ii) dwaya mahAmanthram and (iii) charamaslOkam from his own guru (AchAryan). These three manthrAs are termed as “rahasyam” (secrets). Our shAstrAs proscribe that these can be shared only with ardent seekers who have the insatiable desire to learn them and not with others. Since they are preserved with utmost care, they are called as “rahasyam”. These three that are collectively known as “rahasya thrayam”, are the crux of vedAnta as expressed by our srIvaishNava sampradhAyam. They also specify the Supreme Lord’s true nature as is. They elaborate the path to reach that Absolute Supreme, the subsequent enjoyment of a jIvAthmA after reaching Him (paramAthmA). All the three rahasyams were uttered by the Supreme God himself, in order to exalt the down-trodden people of this universe who are suffering in this place for eons together from the never ending cycle of birth and death and the associated ups The rahasya thrayam was enunciated thus. Bhagawan srIman nArAyaNA took the incarnation of NArAyaNA (AchAryan) and elaborated the first rahasyam – Thirumanthram, to Nara (sishyan) at badarikAshramam. Bhagawan told the “Dwaya mahAmanthiram” to His divine consort Sri mahAlakshmi (periya pirAtti) in Srivaikuntam. Finally, Bhagawan incarnated as Krishna and steered the chariot and served as the charioteer for HIS friend arjunA during the battlefield of kurukshEtra (the battle of Mahabharatha). It is during this time that He enunciated the “Charama SlOkam” towards the end of “Bhagavath Geetha”. These three rahasyAs are being passed along the srIvaishNava Guruparampara lineage. The ancestors of SrIvaishNava lineage who have realized the Supreme and have adeptly pointed out the infallible yet easy path to reach the Supreme, have treasured these three rahasyams with utmost care. (These three are not similar to any earthly treasure that is kept in a locker without any usage. It is as usable as it is treasured). Our ancestors have always used them in every walk of their lives. Such is the greatness of these rahasyams. The “Dwaya Mahamanthram”, celebrated as the “jewel of all manthrams”, has two lines in it. The first line elaborates the inner meanings of the “namaha” part of thirumanthram, and the second line clarifies and details out the “NArAyaNAya” part of thirumanthram. Since it has two lines in it, it is being referred as “Dwayam”. The first line in Dwayam talks about the different ways to take refuge at the Lotus Feet of Bhagawan. When a person catches hold of Bhagawan’s feet, he should do so by renouncing all other means that he had earlier undertaken, in order to reach Him. The person should do so in such a way that there should not be any iota of earlier paths’s thoughts left in him. Moreover, he should also renounce the lingering fact in his mind that “I have caught the Lotus feet of Bhagavan, and this act of mine will definitely take me to HIS Protective Lotus Feet”. (The reason he is expected to leave that thought as well, is because if he does not, then it appears that something apart from Bhagawan’s Feet, i.e., one’s own effort of submission, can fetch mOksham. It cannot fetch mOksham at any cost and so should be completely gotten rid of.) Hence, the only refuge is Bhagawan’s Lotus feet and nothing else and one should be very determined in this basic principle. The second line in Dwayam talks about the benefit to such a person who had renounced all his own efforts. The benefit is the golden opportunity to do eternal service to the Lord together with HIS consort (pirAtti) (and to HIS devotees). This is like the service that lakshmanA rendered to Lord rAmA and sIta in srIrAmayaNam. However, this kind of an opportunity (doing eternal service to the Divine consort and their devotees) comes only after all the sins, that have been accrued due to karma, have been annihilated. Dwayam that comprises of two lines is being expounded in detail by the third rahasyam known as the CharamaslOkam. Thus CharamaslOkam is based off of Dwayam. Dwayam is juxtaposed between Thirumanthram and CharamaslOkam. (Dwayam explains in detail the “namaha” and “NArAyaNAya” part of Thirumanthram. It also creates a platform upon which CharamslOkam thrives by answering certain implied meanings of Dwayam. Even though Thirumanthiram and CharamaslOkam have connections with “srI”, (srI sambandham), Dwayam is the only “rahasyam“ that has “Sri” spelt out explicitly. Thus, of all these three rahasyams, it is the Dwayam that our ancestors have regarded as the most important and significant. As stated earlier, the first line of Dwayam talks about a jIvAthmA that renounces all his efforts, and recognizes and takes Bhagawan’s Lotus Feet as his last and only frontier. This is essentially known as “saraNAgathi”. The saraNAgathi is of two types. The first type is that doing it with an urgency like “I can no longer be in this world, not even for a split second more. I have realized about the “Supreme You” and would like to reach You right away without any delay”. The second type is doing it with the thought that “Oh! My Supreme Lord! You bestow upon me mOksham whenever You deem is the right moment”. Out of these two types of prapathi, the former is always greater than the latter. (The former is known as “Aartha prapathi” and the latter “Druptha praparthi”) The first pasuram of Gyana Saram talks in detail about “Aartha prapathi”, the ‘urgent’ type. veedu arulum = will liberate and grant mOksham. This body of ours is made of flesh. It is made of impure stuff like skin, nerves, muscles, bones, excreta, so on and so forth. It is been regarded as “PuNNAr Akkai”. That is, if the skin is torn and even if a small amount the size of a small bee’s wing is exposed, then various flies, insects, ants, crows, etc., would surround it to eat the flesh, etc. (Taken from nAladiyAr’s thuravaraviyal,(regarding sainthood), first poem namely “thUythanmai”). If the inner parts of the body are exposed, then one would not find enough time to ward off the crows trying to eat them. Those who realize this would develop a natural grudge on this body and would always see the soul inside the body than the body per se. On top of it, the stay of the soul inside the body is perceived just as a prisoner held captive in a jail. The soul, by itself, is resplendent with knowledge but it is being clouded by a layer of ignorance when it is kept inside the body. This is similar to how a sparkling piece of diamond is kept inside a pot that inhibits the diamond from showing its radiance as long as it is under its wraps. The very fact that the soul is so immersed and invisible in the body is its greatest punishment / sentence given by the Supreme Lord. The acts of those who do not realize that it is a jail and continue to enjoy the mundane stuff are akin to one of a mentally challenged. Those that have the cognizance (gyAnis) will try to break these shackles of the prison and would want to escape from it forever. They (gyAnis) know that doing saraNAgathi towards the Supreme Lord is the only way to get out of such prison and that nothing else can salvage them. Krishna in His Bhagavath gIthai has told that it is HE who can make a person come out of the bonded prison. The reason a soul is being held captive in the body is due to its karmic effects. Nothing other than saraNAgathi can nullify these karmic effects. Krishna has told time and again that “If a person surrenders at MY feet, I will ensure that the AthmA is freed from such a prison”. A common man’s power is not much – he cannot even untie the locks of a sparrow’s nest. With this being the case, can he ever untie his body from the locks of karma, that has been cast upon him by the Supreme? A wealthy person who has been imprisoned would want to get relieved from the jail first than enjoying the luxuries of the outside world. Similarly, the first thing to do for the soul is to get rid of this jail called “body”. Since the jail is such an inferior place, the only way out is saraNAgathi. The way to do saraNAgathi is to completely surrender unto the Lotus feet of Sriman NArAyaNan through His consort periya pirAtti as specified in dwayam. The act of giving oneself up completely and falling under HIS feet is as sweet as having a sweet honey. Those who got an opportunity to taste it will always think about HIM and HIS sweetness forever. He will always want to enjoy that experience. Like how a hungry child yearns for his / her mother’s milk, the one who does saraNAgathi (saranAgathan) would always yearn for the sweet nectar of the Supreme Lord’s Lotus feet. When he surrenders to the Lord, it is a complete surrender, meaning the person relinquishes all other ways that he thought would take him to the Supreme, and all his interests in other worldly things. Those ways and things that he liked earlier to saraNAgathi will automatically vanish into thin air, once he sets in for surrender. 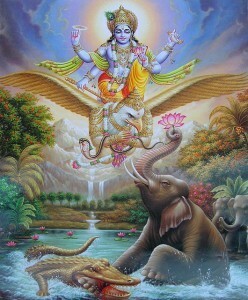 This is the essence of this pAsuram. To give an example to it, Swami aruLALa perumAL emperumAnAr says that just like how a fully ripened fruit falls automatically from the tree thereby breaking all the connections it had with the tree before, a saraNAgathan, when he does saraNAgathi, is assured that all his previous practices, norms and ways go away and bear no connection in the relationship between him and the Lord. This act of breaking the previously established connections happen automatically when the saraNAgathan performs total surrender. When the person does saraNAgathi and yearns to experience and enjoy the sweet nectar of the Lord’s feet from the very next second, it pleases the Lord immensely. He grants him his wish immediately. On the other hand, he who do surrenders but is willing to wait for the Lord to grant mOksham as per HIS wish, will also be liberated and assured of enjoying Lord’s sweet nectar, after his body falls down at the time of his death. When one realizes that this body is a prison, and yearns for the divine enjoyment with the Lord forever, and performs saraNAgathi to HIM with the help of Periya Pirati, after breaking the shackles that he had with the external world, when he performs such a saraNAgathi, bhagawan would be kind to that person and give mOksham. So, saraNAgathi done with urgency to go to mOksham would immediately give him mOksham is the significance of this pAsuram. Getting liberated (mOksham) is like crossing a big ocean of worldly sufferings andreaching Bhagawan at the other side of the shore. Periyazhwar says “akkarai ennum anatha-k kadaluL azhundhi ikkarai yEri iLaithirundhEn” – (Periyazhwar Thirumozhi 5-3-7). A philosophical question is raised at this instance. If it is said that Bhagawan Himself will grant mOksham, then is it not contradictory to believe that saraNAgathi will grant mOksham? Moreover, saraNAgathi is just an act and it does not have consciousness by itself. If such an act has the power to grant mOksham, is it not contradicting the obvious truth that only Bhagawan has the knowledge and the power to grant mOksham? These are some typical questions that may arise at this point. The answers to it are as follows. Whatever action a devotee performs, including saraNAgathi, bhakthi, penance and the like, will only make him “qualified” to get mOksham. It never has the ability to grant mOksham but will just make a person eligible/ready to receive mOksham. Our scriptures term this as “adhikAri vishEshaNam”. Only bhagavan can give mOksham after becoming compassionate seeing this saraNAgathi. There is a beautiful illustration for this. People construct a big lake by digging out a vast area of land and creating a very big space to hold water. The motive behind this is that when it rains, the rain water could be accumulated in a central reservoir. But, just because a large block of lake has been created, there is no guarantee that it would rain. However, if one fine day, it rains, then if there is no space to store the rain water, then all the rain will not be stored and hence the very objective of storing rain water will be defeated. Similarly, even though a soul does saraNAgathi, that will not grant mOksham by itself; rather it will just make him ready to receive the Lord’s untainted compassionate love. The Lord’s compassion is independent; it does not depend on anything to trigger it. There is no reason needed for the Lord to shower His love on us. So, when the Lord’s compassion is all set to flow, we should be qualified and be ready to receive it. This act of preparing oneself and be ready to be a recipient of Lord’s mercy is known as saraNAgathi, bhakti etc. The qualification can never be a reason. This point has been clarified by bhUdhathAzhvAr in “vanathiDarai eri Am vaNNam iyatrum idhuvallAl mAri yAr peygirpAr? matru”. So, we do realize the truth that only the Lord can give mOksham and that our acts can only make us qualify when the Lord actually showers his independent and unconditional mercy. One should know that this body that is made of flesh is a real time prison and hence should quickly develop the desire to escape from it. He should be eager to experience the sweet nectar emanating from the Lord’s feet. This is known as saraNAgathi that is being done when all the connections from the earlier desires and ways have been cut off forever and falling at the Lotus feet of the Lord, just like a fully ripened fruit is cut off from its tree and falls on the ground. The body is an enemy in getting mOksham. To win over this enemy, saraNAgathi is the weapon available to us. 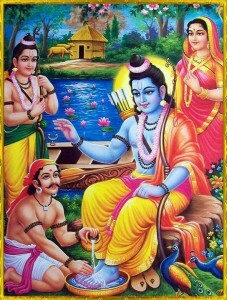 To illustrate this point, we can look at the saraNAgathis that Bharatha and Vibishana did under the Lotus feet of Rama. Bharatha suffered only because of his mother, and Vibishana suffered due to his arrogant brother rAvana. Both of them are not able to suffer anymore. The above two are about the sufferings of the soul inside a body and its need to quickly get out of it by falling at the Lord’s feet. Hence these two are saraNAgathis. Whether it is Bharatha’s suffering because of his mother or VibishaNa’s suffering from his brother, or soul’s suffering from its body, the only path to salvation is saraNAgathi to Lord’s feet. Both Bharatha and VibishaNa have performed the first type of saraNAgathi described above, which is to yearn for the divine experience of enjoying Bhagawan’s Lotus feet immediately with urgency. In the same way Athma also yearns to leave this body and performs saraNAgathi. avan sadA maNdalam niraindhu pOi vazhindhu sOravE. So with a lot of angst when a soul does saraNAgathi, the Lord would show his mercy and grant mOksham is the meaning. (“upAyam” is the way or means to attain and “upEyam” is the object that is being attained) – Our ancestors call this “irakkam upAyam, inimai upEyam”. That is, His compassion/mercy is the means, and what is attained is the sweetness (of serving Him). In Bharatha and VibIshana saraNAgathis, we do see that Vibishana saraNAgathi was successful whereas Bharatha saraNAgathi was not. (This is a separate topic by itself as to why Bharatha’ saraNAgathi was not successful whereas Vibishana’s was. The bottom line here is that for Bharatha, Rama did not deem it to be the right time to yield to his requests because He had a plan to be in exile for 14 years, protect the rishis in the forest, meet Vibishanan and get him to HIS troop and accept him and kill Ravana and so on. He had a detailed plan and in came Bharatha. His saraNAgathi was not successful at that point since he had to wait for 14 years. It goes ahead to bolster the point that it is the Lord’s independent nature and it is He who chooses when to fructify the acts of a saranagathan. In the rain example that we saw earlier, Bharatha’s case was like the lake was created but it was not the right time for rain”.) In srIvachanabUshanam, swAmi piLLailOkAchAryar says “Bharathanukku nanmai thAnE thImai Ayitru”. Hence, the acts of saraNAgathas can only be a qualifier (adhikAri visEshaNam) and cannot be a granter of mOksham. So when this pAsuram says that saraNAgathi would give mOksham it is explaining about how saraNAgathi would avoid delays in giving mOksham (if the person wants it immediately), and it does not say that saraNAgathi itself would give mOksham. It should be understood that all these truths about saraNAgathi are being elaborated by swAmi maNavALa mAmunigaL in his explanation of this pAsuram. In English, based on the thamizh prose mentioned above, which is based on srI maNavALa mAmunigaL’s vyAkyAnam . Explanation: The one whose avathAram is in the month of kArthikai and in bharaNi star, onewho surrendered to srI rAmAnujar the head of saints, who in his gyAnasAram pramEyasAramspoke about the greatness of AchAryan, adiyen surrender to that aruLALa mAmuni(aruLALaperumAL emperumAnAr). I bow to aruLALa mAmuni who is – a good sishyA or ramAnujAchariar, who is – an expert in vedhAs and other sAshthras, and the one who took up the fourth Ashramam that is sainthood. (rAmAnuja sachchishyam) – Recall the incident explained in guruparampara, when with the original name of yagya mUrthy he debated with emperumAnAr for eighteen days about vEdhAntha based on tharkam etc., and made emperumanAr very concerned about saving the sampradhyAm, pEraruLALr athigiri varadharAja perumAL came in emperumAnAr’s dream and said ‘O emperumanAr! Please do not be discouraged. I am giving you a talented sishya that I created. You shall win him over”. 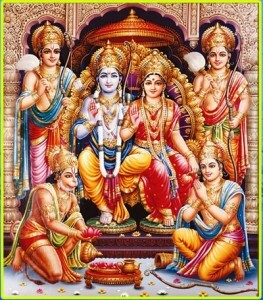 (vEdha sAsthrArtha sampatham) – We can understand well about his deep knowledge in sAsthras when we see how he debated with emperumAnAr for eighteen days, and how he provided us the essence of sAsthrAs through his gyAnasAram pramEyasAram by beautiful and easy to understand pAsurams which are based on thamizh veNpa (a type of poem defined In thamizh grammar). (dhEvarAja munim) – Based on his greatness of having the blessings of dhEvarAjan, that is pEraruLALan. to became a sishya of emperumAnAr, and based on the greatness of his being equal to emperumAnar in gyAna, bhakthi, and vyrAkyam, we understand that he got an apt thirunAmam of ‘aruLALamuni’. aruLALa mamuni-am porkazhalgaL adaindha pinnE. Explanation: adiyEn obtained the way to destroy the ever-accumulated karmas, after surrendering to the beautiful and divine feet of the one who through his gyAnasAram pramEyasAram fed the knowledge of deep meanings of the four vEdhas and true meanings of thirumanthiram, who is a bright light of knowledge, who is named as aruLALamAmuni. The meaning of the thaniyan is: Because of ever-accumulated karmas, clarity of truth diminishes in us. Because it diminishes, one’s affinity to be attracted to women increases. Because of this, our mind starts dwelling on their curly dark hair and shapely and sharp eyes. But after surrendering to the divine feet of aruLALamAmuni, I understood the ways in which I could get out of such kAmam and related mistakes. To explain further, this thaniyan says: After surrendering to my AchAryan aruLALaperumAL emperumAnAr, I got clarity in my mind after learning his gyAnasAram and pramEyasAram. Because of that, I understood the ways in which I could destroy the bad karmas of being disturbed in my heart by looking at women’s beautiful hair, and eyes that are shaped and sharp like a spear. The destruction of attraction towards women may be extended to destruction of other mistakes like anger, greed, lack of knowledge of truth, ego, jealousy, etc. The thirukuraL also conveys the same meaning in the verse: “kAmam, veguLi, mayakkam immUndran nAmam keda-k kedum nOi”, which implies that those mistakes that destroy human culture would be solved by AchArya kaTAksham. So AchAryan’s greatness was highlighted by this thaniyan. This entry was posted in gyAna sAram, Other on November 20, 2014 by santhanam rajagopalan.